. I have many Thailand Website Design Companies as clients. Designing websites is a very competitive business, I know I design websites myself. every website design company in Bangkok needs to satisfy a niche market. 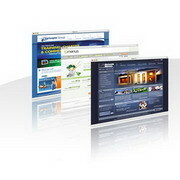 Gone are the days when one web design company could satisfy the needs of every customer. Every company needs to have an edge a particular skill set and expertise that puts them at the top of the list when choosing the right web designing company for the job. My expertise is in designing websites that work. By work I mean make money. Personally I see very little point in making a pretty website with lots of fancy flash animation that does not attract visitors, does not rank high in the search engines and does not make a single dollar in revenue. I work carefully with search engine optimization and website promotion to ensure that the sites I design get the visitors that they deserve who can then choose to buy the product or service they need. No visitors = No sales = No money. There are thousands of website design companies around the world so why choose Thailand? Quality - The web design companies in Bangkok are mostly first class operations. Built on western models, often with western managers in the team they provide a service of international standard for domestic and international clients. Innovation - I mentioned before that web companies need to have the skills to satisfy a niche market or they do not survive very long. Thai programmers and designers may not on the surface appear to be the brightest of individuals on this planet but they have some great ideas and with the right backing tjhe ability to see these ideas reach the web pages of their clients. Cost - Thai website designers, graphic designers and programmers earn about one tenth of what they do in the west. That is not to say that a custom built website will cost you a tenth of say a website designed in America or half of what it would cost in India but it doesn't take a math genius to work out a website designed in Thailand will save you a lot of money. So what type of website do you need? Send me your ideas and I will put you in contact with a good professional website design company in Thailand who can do the job. Please email bangkokcompanies@gmail.com with your requests. j.p. virtual solutions, matt productions co.,Ltd. three e business engineering co.,Ltd.